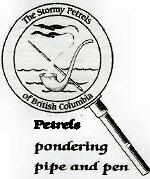 The annual Petrel Croquet and BBQ will go ahead, rain or shine on the borders of Surrey, as usual, on Saturday, August 15, 2009, 3:00 pm until sunset. Appetizers and after-dinner coffee or tea will be provided as will great company and an always enjoyable round or two or croquet. (who can top Len this year?) Prizes will be awarded! In the event that a croquet match is cancelled due to rain, a rousing game or two of Sherlock-o may be substituted.